When we are dealing with confidential information or data we need to Protect Workbook if you want from the user to edit data, delete data, and move data in Excel VBA. If user wants to see data in workbook user should have password to view data in the workbook. We need to protect workbook at the end of the procedure once changes has done to the workbook using VBA. If you forgot the password, you cannot unprotect the workbook. Why we need to Protect a Workbook using VBA? When workbook has sensitive data to deal with confidential information or data we need to Protect Workbook in Excel VBA. You should protect your complete workbook then only authorized users can view or modify the data. Here is the syntax to Protect workbook using VBA. Password: Its Optional argument. It specifies a case sensitive password for the workbook. If we want to protect workbook then you have to mention password argument, otherwise you can omit it. When you want to unprotect your protected workbook you must specify your password. 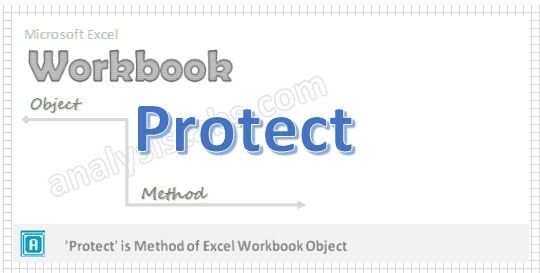 In the above syntax we are using ‘Protect’ method of workbook object to protect the workbook. Please find the below example, It will show you how to protect the workbook. In the above example we are protecting the workbook by using ‘Protect’ method of Worksheet object in the worksheet named ‘Sheet1’. When working workbook code has password protected, if you want to do any changes in the code first you have to unprotect the password at the beginning of the procedure and at the end of the procedure you have to protect it again. Here is the example to protect ActiveWorkbook with password.